Under Liggett's leadership, the corps participated in the Second Battle of the Marne and in the reduction of the Saint-Mihiel Salient. 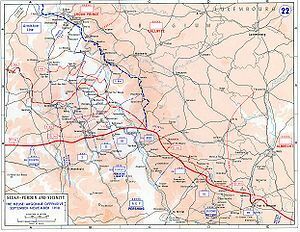 In October 1918, as commander of the US First Army, he directed the final phases of the Meuse-Argonne offensive and the pursuit of German forces until the armistice. After commanding the U.S. Third Army also known as the Army of Occupation on the Rhein bridgeheads, Hunter Liggett retired in 1921. Congress promoted him to permanent lieutenant general in 1930. He died in San Francisco, California in 1935 and is interred at the San Francisco National Cemetery.